If you capitalise on a sunset landing with American Airlines into Rapid City Regional Airport, you’ll be greeted by swaths of cotton candy clouds set among rolling hills and a seafoam sky. 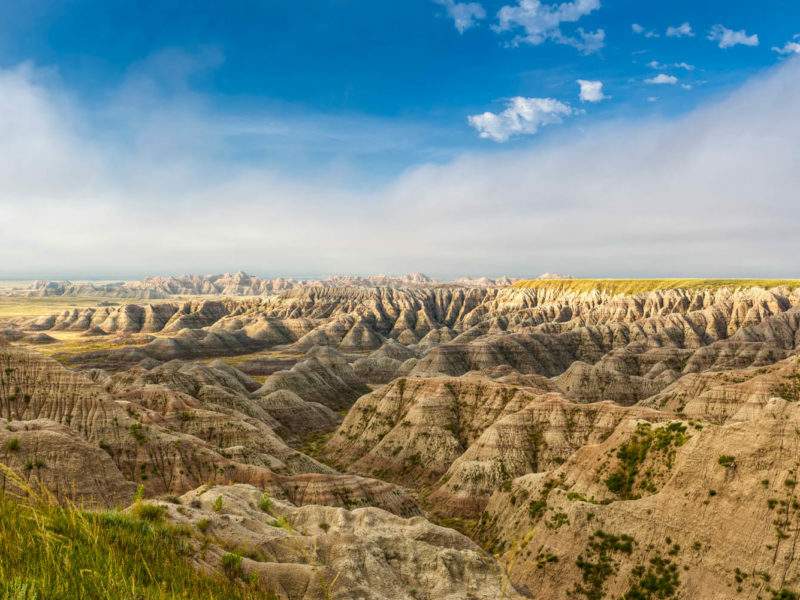 Most assuredly – despite it being a landlocked state – you’ll quickly realise that South Dakota knows no bounds. From majestic historic monuments to the forested pleasures of the state’s national parks, it seems like there’s never enough time to soak it all up. 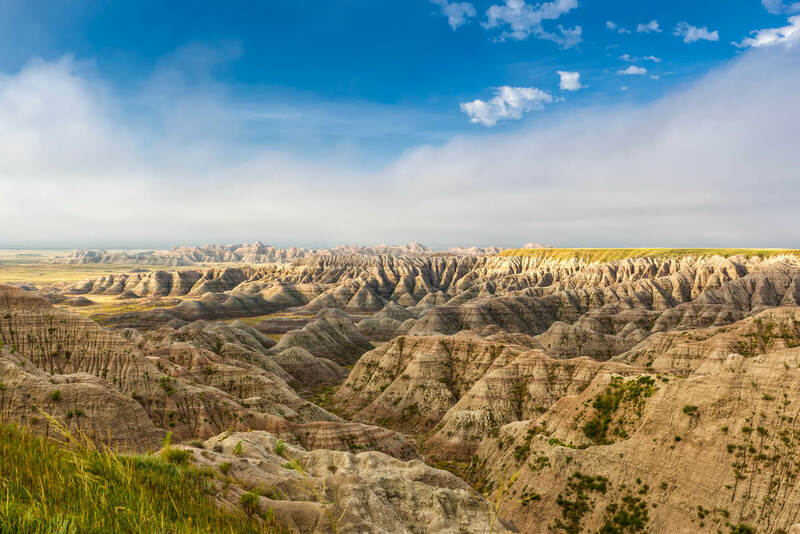 But fear not, saddle up with a rental car and blaze through this glorious state whose Midwest charm and western hospitality will have you pondering why you didn’t visit sooner. A swift 15-minute drive from the airport, arrive at Residence Inn by Marriott for a restful night’s sleep. Wake up to a free hot breakfast in the morning then drive into downtown Rapid City and visit Essence of Coffee for killer brews and South Dakotan hospitality. Opened in 2013, the local hotspot is proudly Aussie owned and operated by partners who hail from Perth, Dale and Michael Fewson. Coffee beans are sourced from prime growing regions such as Peru, Brazil and Ecuador, and roasted in-house. Opt for a silky almond milk latte and follow it up with a decadent cream cheese & triple berry-filled crostata to fuel your day with sweetness. Then swing by Prairie Edge for shopping opportunities and to learn about the North American tribes (such as Oglala and Miniconjou) and their descendants whose artful wares and curios are on display and for purchase – the expansive selection includes beadwork, jewellery, hides, Pendleton blankets, and more. Hit the road again and careen over to Crazy Horse Memorial; gaze upon a storied work-in-progress: the profile of this revered Lakota warrior who’s been etched and carved into pegmatite granite. Here you can spend hours at the knowledge centre and art gallery learning about aboriginal tribes along with the genesis of this inspired passion project, started by Korczak Ziolkowski in 1948. It’s part art appreciation, part education and a whole lot of awe and wonder. In the afternoon, drive 30 minutes east and have lunch at State Game Lodge Restaurant inside Custer State Park. Housed inside a turn-of-the-century game lodge, the converted restaurant is the flagship eatery of the national park. Chef Chris Keller prides himself upon the use of indigenous ingredients such as buffalo and pheasant, but bolsters this with global flourishes that include French, Mexican, and Asian. The braised buffalo empanadas exemplify these worldly flavours. Buttery homemade shells are stuffed with braised buffalo tenderloin scraps and charred tomato salsa. The lily is glided when these pleasure pockets are drizzled with homemade chipotle aioli. Afterwards, drive up route 89 towards the serene beauty of Sylvan Lake and take a brief stroll along the waters and pristine views of boulder-esque ragged rock (fun fact: the 2007 film National Treasure was filmed here). Round out day one with a 30-minute drive east towards Mount Rushmore National Memorial. Gaze upon 18-metre high presidential history and artistry as you greet leaders of the past (George Washington, Thomas Jefferson, Theodore Roosevelt and Abraham Lincoln) whose faces have been chiselled into granite. Sylvan Lake (part of Custer State Park). Midday, drive over to Spearfish Canyon and hike to your heart’s content. If you’re hankering for a climbing challenge, the 76 Trail is a must. Just under two kilometres each way, the intense vertical climb ascends over 300 metres. You may be sweaty and sore, but that’s easily forgotten when you’re rewarded with panoramic, lush forestry and sprawling sights of Spearfish Canyon. The trail will undoubtedly create hunger pangs, which you can alleviate at Cheyenne Crossing. A nine-minute drive south-east and you will have arrived at David Brickner’s popular outpost. The late 1800s converted stage coach stop is now a restaurant that offers what Brickner describes as “Americana Cabin” fare – chef Matt Johnson’s Indian Taco is an exemplary mash-up. A large puffy WoodenKnife fry bread is piled high with meat and bean sauce (pro tip: ask to switch from beef to buffalo! ), and then it’s topped with shredded lettuce, tomatoes, onions, cheddar cheese, black olives, a fat dollop of sour cream and picante. You may need a nap afterwards, but it’s well worth conquering this edible mountain. Then, take a meandering scenic drive on CanAm highway north-east of the restaurant into the town of Deadwood. Try to strike it rich in this historic gold rush/mining town for casino and poker games with the locals at Saloon 10. Quench your thirst with an (in)famous Scooby Snack cocktail which is a sunshine blend of Malibu, midori, pineapple juice and cream. Or if you’re keen on something strong enough to knock your boots off, you’ll love the 150+ artisan bourbon, whiskey and Scotch varieties available to try. In the morning, wake up from sound slumbering at SpringHill Suites Deadwood, thanks to its ideal location on a quiet road stretch of CanAm highway – a 10-minute stroll from downtown Deadwood’s main street. First, make a pit-stop at Toni Gerlach’s Pump House for a much needed java jolt and local pastries. The space is also home to her Mind Blown Studio where she does glass-blowing onsite and crafts stunning sculptures (feathers, elephants, dream catchers, etc.) and functional pieces for purchase (e.g. vases, pen holders, oil jars). Interested guests can also opt to take hands-on classes and learn about this art form. From there, it’s a quick uphill jaunt towards Mt. Moriah Cemetery and where you can tip your hat and pay respects to brazen gun-slinging folk of the past such as Wild Bill Hickok and Calamity Jane, who are now resting in peace. And don’t forget to wander over to Brown Rocks Overlook at the west end of the cemetery – there are wondrous sweeping views of Deadwood and the Black Hills. Before making the pilgrimage back to the airport, capture one last breath of the wild outdoors; slather on some sunscreen and hike up Mt Roosevelt. Part of Black Hills National Forest, it’s less than a 10-minute drive outside of downtown Deadwood. From there, it’s an easy 1.6-kilometre walk through emerald wilderness. You’ll be greeted by the Mt Roosevelt Monument aka Friendship Tower which was erected in the 1900s by legendary Deadwood Sheriff Seth Bullock as a memorial tribute to Theodore Roosevelt. Climb up the tower’s spiral steps and glimpse captivating views that include Bear Lodge Mountains, Custer Peak, along with the towns of Lead and Deadwood. American Airlines operates daily service from Sydney (SYD) to Los Angeles International (LAX) with its Boeing 787-8 Dreamliner aircraft. From there, it’s a swift connection to Dallas/ Fort Worth International Airport (DFW) and into Rapid City Airport (RAP). Premium Economy is a recent and new feature service option on American Airlines, which is situated right behind Business Class. For those who are budget-conscious but are seeking more comfort on-board, this is an affordable upgrade that is ideal for long distance travel. 29 fully lie flat beds and direct aisle access seats in Business Class, 21 Premium Economy seats and 234 Main Cabin seats. In the Premium Economy service, you get priority boarding, larger leather seat including 38 inches of pitch, and larger touchscreen monitors for entertainment (movies, TV, music, games). Also provided is an amenity kit, chef-crafted meals, and complimentary wine, beer, and spirits.